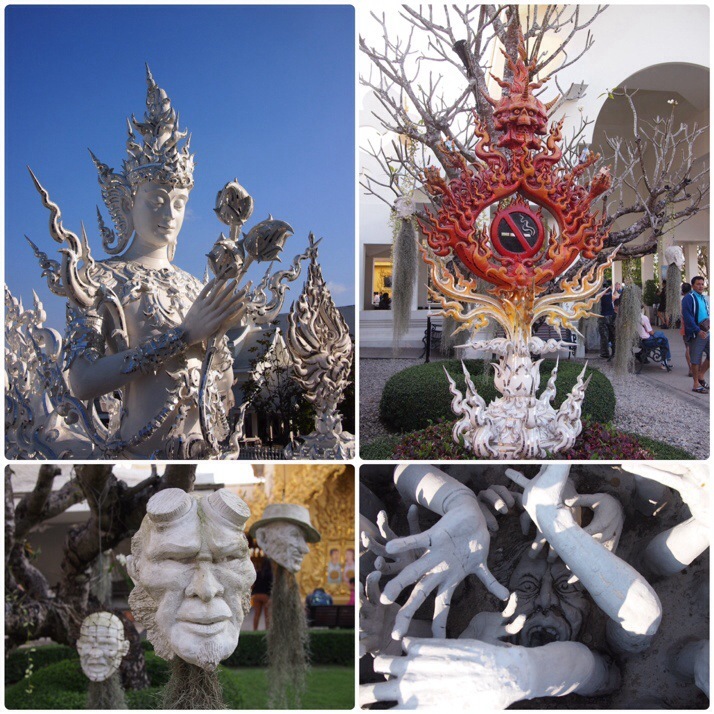 From afar Wat Rong Khun, or the White Temple as it is commonly known in English, looked to us like a Christmas cake covered in snowy white icing, but as we moved closer we could see that the effect is created by whitewashed concrete studded with glittering mirrors. 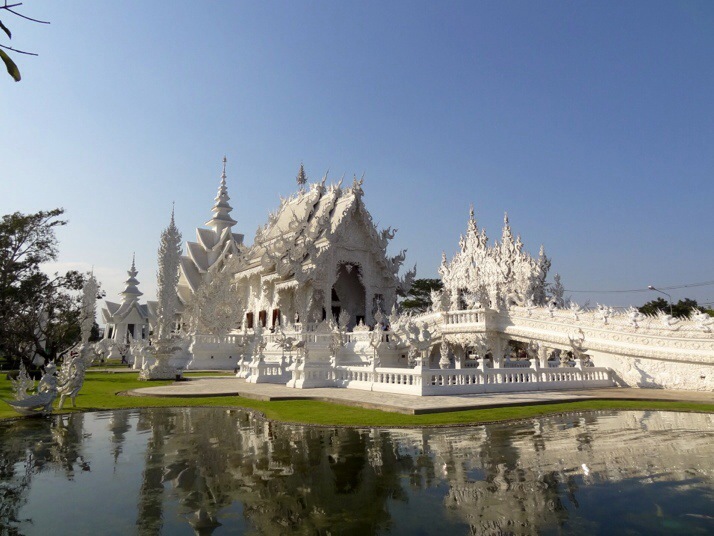 The temple complex is the vision of artist Chalermchai Kositpipat, a devout Buddhist wishing to give something back to the world. 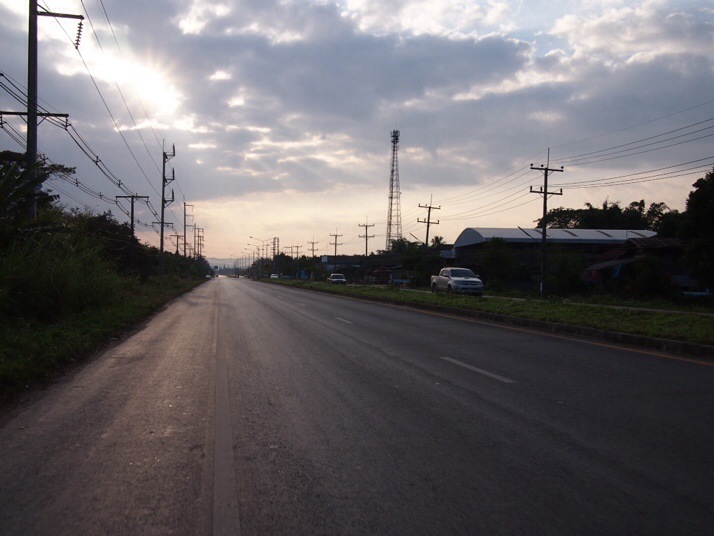 Construction began in 1997 but is not expected to be completed until 2070! Eventually there will be nine buildings in the complex, and we saw several of these in various stages of construction from concrete and steel poles, to structurally finished but undecorated. 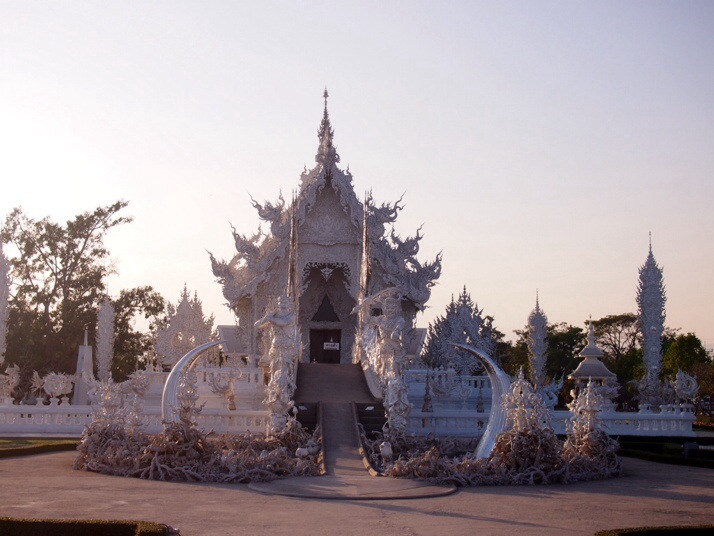 The temple’s mix of modern sculpture and ornate decoration blended into a religious building reminded us of the Sagrada Familia cathedral in Barcelona, also still under construction. The main prayer hall is approached via a bridge across the reflecting pool. The entrance to the bridge is surrounded by the disturbing sight of hands reaching up in seeming desperation and despair. The artist designed this to remind people that “To reach heaven, you need to pass suffering”. Unfortunately it’s not possible to take photos inside the main prayer hall but we had fun trying to pick up all the references in the completed painting on the back wall – everything from planes crashing into the Twin Towers in New York, to Michael Jackson, Superman, Freddie Kruger, Hello Kitty, Predator and Neo from The Matrix films! 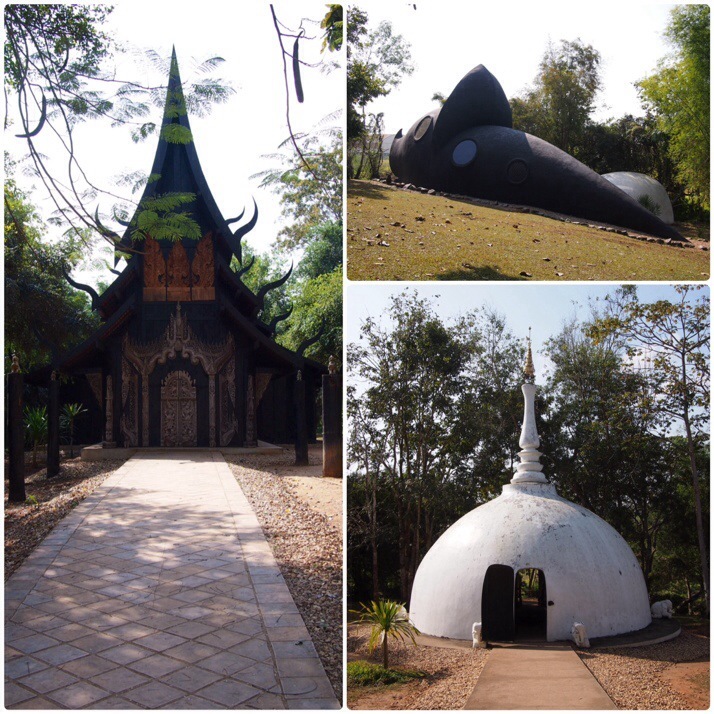 On the opposite side of Chiang Rai is Baan Dam, the Black House, the creation of another local artist, Thawan Duchanee. It’s quite a contrast and just as fascinating. 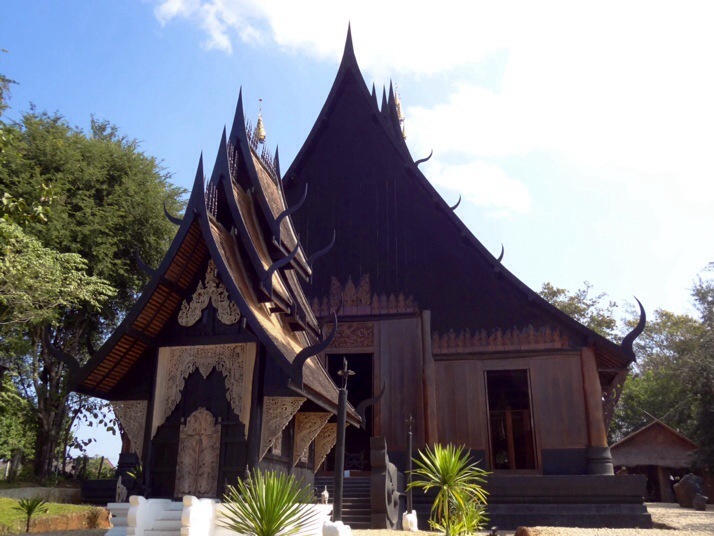 Although many of the buildings here are in the northern Thai Lanna style and look similar to temple halls, it is not a religious site. 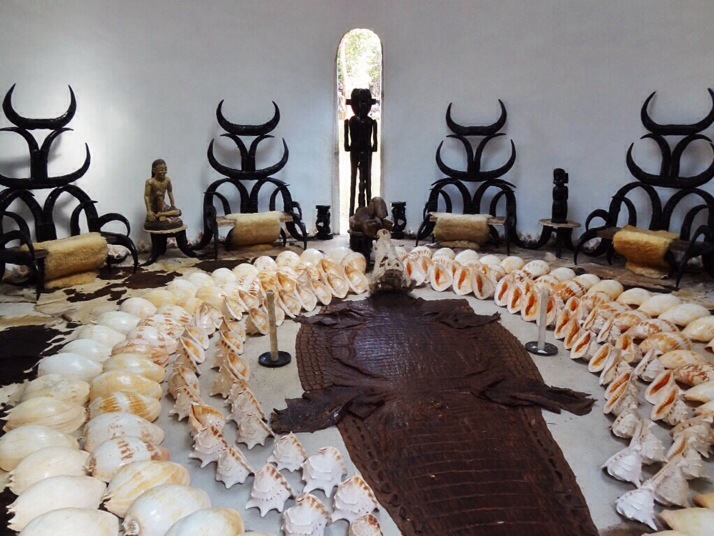 It’s not an easy place to describe, it seemed to be part art installation, part guest quarters, and part creepy collector’s exhibit. Or maybe the sets from some kind of fantasy film with knights and dragons. 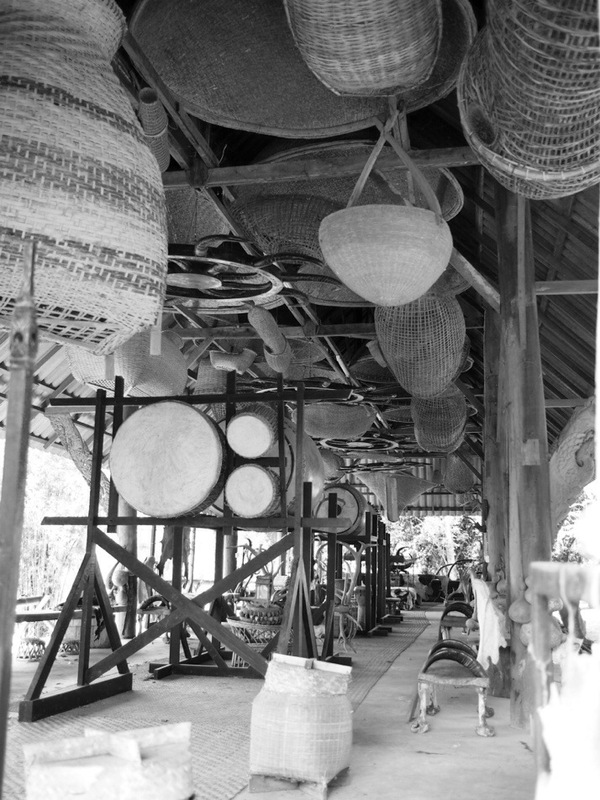 It’s not just a museum though, this is actually Duchanee’s estate, his home in Chiang Rai, and consists of dozens of buildings spread over a pretty large area. Not all of the buildings are open for visitors to go inside but for most of them it’s possible to peer through the window and marvel at them. Some seemed purely to be exhibition spaces, but many were set up like dining rooms, bedrooms or even, in one case, a kitchen complete with stainless steel sink and bright red fridge! 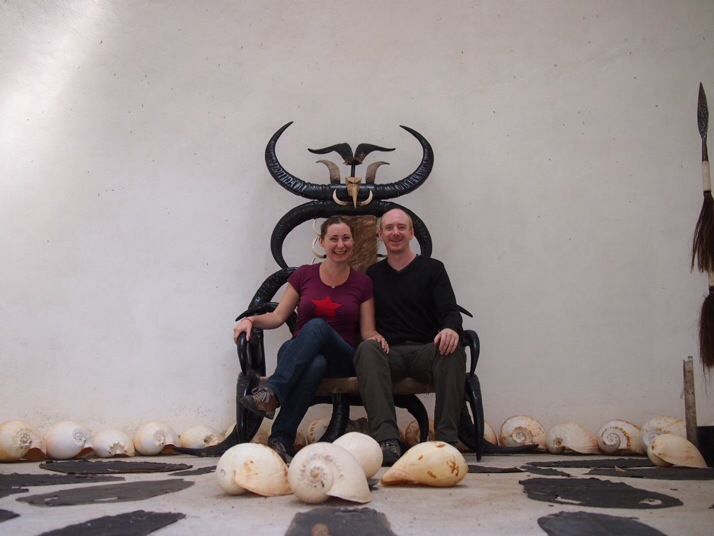 We also stumbled upon a couple of bizarrely decorated toilets which seemed to be for visitors’ use. 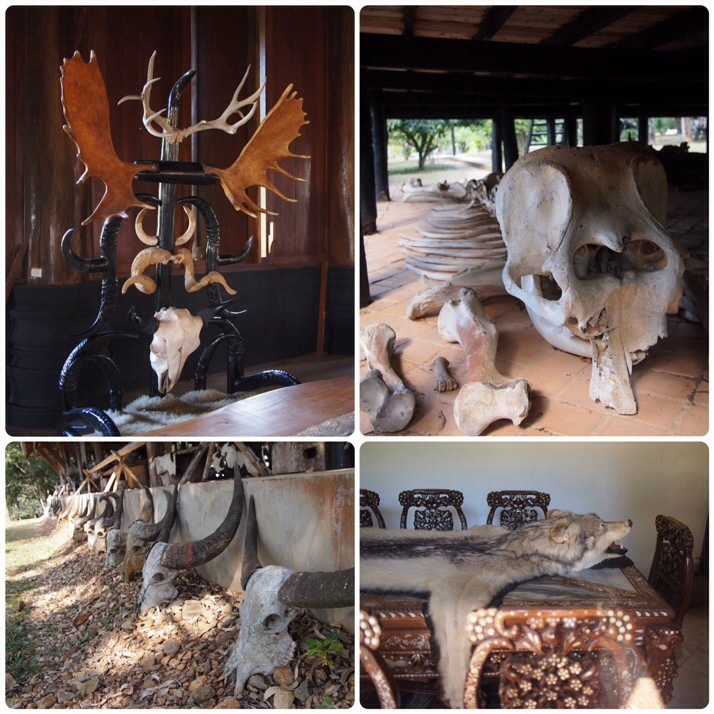 Without exception the furniture and decoration was linked to the natural world and largely the animal kingdom with dozens of different kinds of furs, skins, skulls, skeletons, horns and antlers together with heavy wooden table tops and carvings. 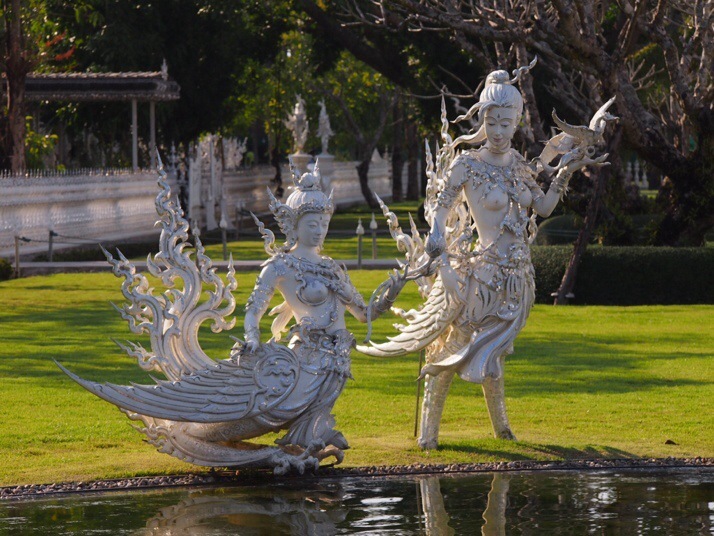 Some of the sculptures and carvings looked to have Buddhist influences but others seemed more tribal. 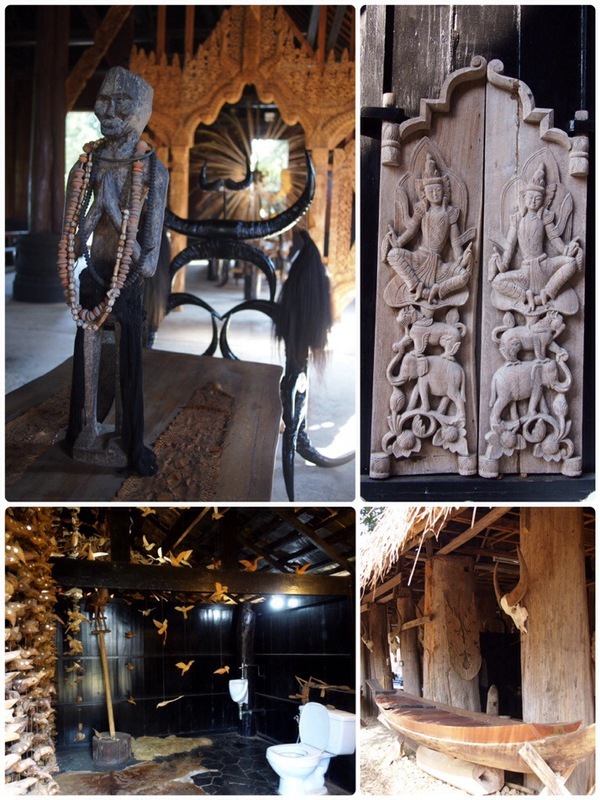 A range of exhibits (clockwise from top left): inside the main hall, some of the wood carving has a clear Buddhist influence, boat outside an open-sided building, toilet decorated with mobiles of birds! 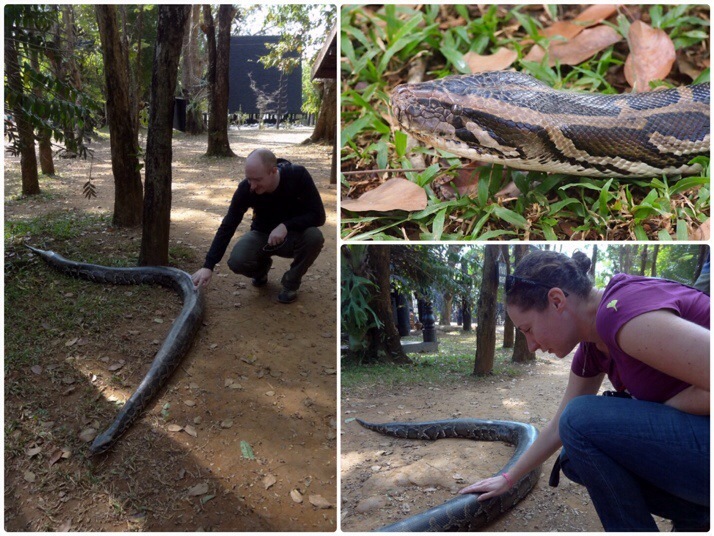 While wandering around the grounds we’d seen a mesh enclosure which on closer inspection we found to contain two huge snakes. Pretty cool, but probably best seen from behind bars… So imagine our surprise when passing in that direction again we saw one of the snakes on the ground outside the cage! Don’t worry, it hadn’t escaped, there was a man watching over it and stopping it from slithering off. After we’d watched for a while and seen a couple of other people touch it, first Andrew, then I, plucked up the courage to touch it too. It felt very cold and dry. 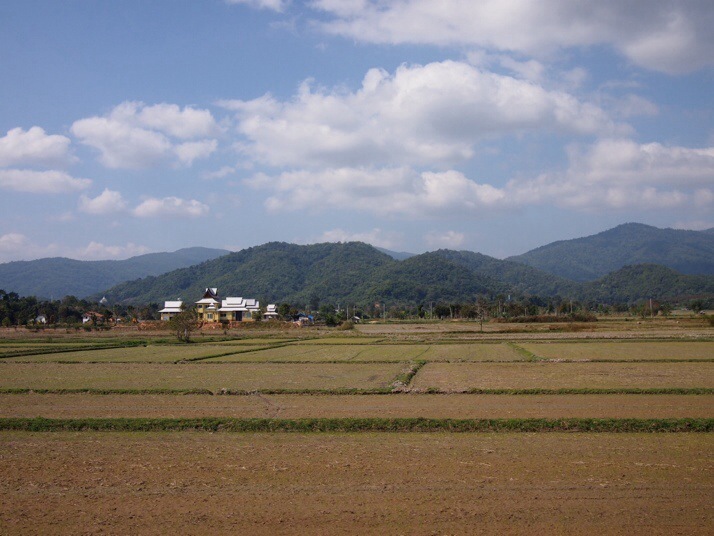 Our guesthouse owner had suggested that after the Black House we should go to the Golden Triangle 60km away. Well we had a full tank of petrol to use up in our rented motorbike so off we sped. 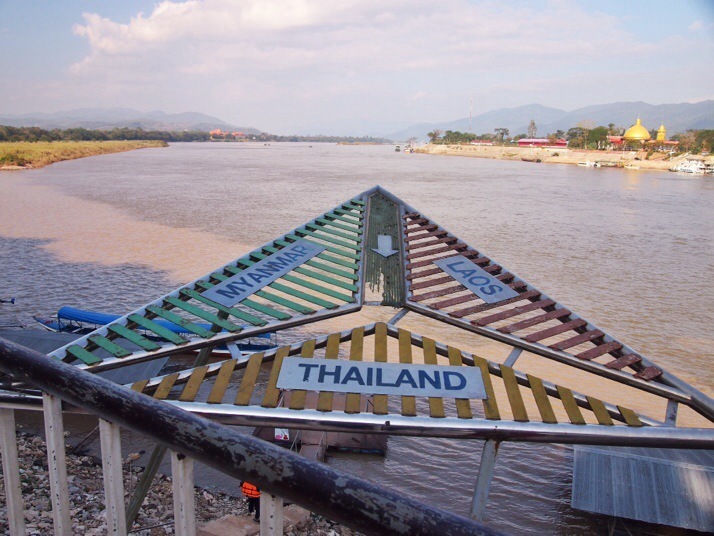 The Golden Triangle is the area around the confluence of Nam Ruak with the Mekong River and is where Thailand, Myanmar (Burma) and Laos meet. Historically this was an important trading area particularly for opium. Nowadays it’s just a (nice) view of the river, a large seated golden Buddha and a collection of stalls selling the ubiquitous elephant print trousers amongst assorted other souvenirs. 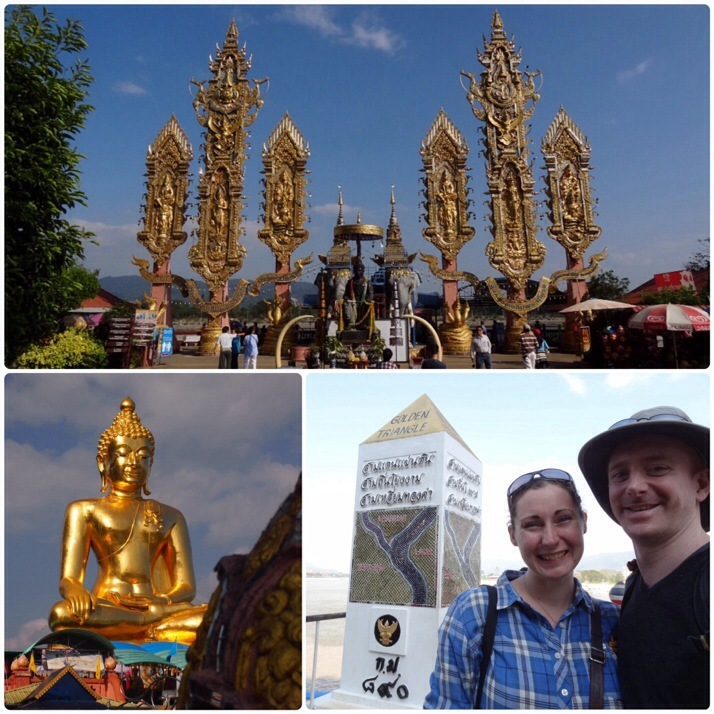 It would have been good to have had a full day to explore the region, the small town of Chiang Saen where we stopped for lunch had some historic sites to investigate and there is a museum of opium which might have given us a bit more context. As it was it seemed like a long way to go for a view especially as there was a surprisingly cold breeze on the bike. 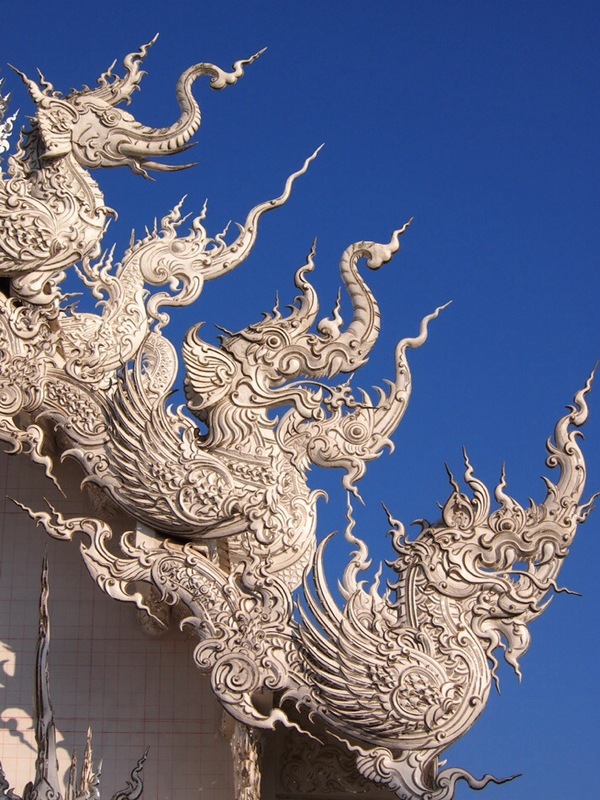 This entry was posted in Places and tagged Art, Chiang Rai, temple, Thailand on January 26, 2014 by Julie.